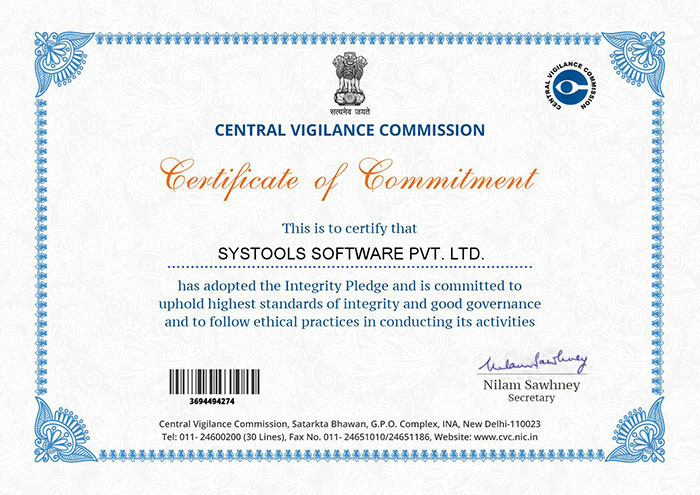 SysTools Certified with Certification of Commitment by Central Vigilance Commission SysTools was recently presented the Certificate of Commitment by the Central Vigilance Commission of India. The certification is to notify that SysTools has officially adopted the pledge of Integrity through which it becomes committed towards holding highest standard of honesty and integrity towards the law enforcement rules in all forms. Mr. Anuraag Singh, Director SysTools, Certified by Central Vigilance Commission of India The Co-Founder and CEO of SysTools, Mr. Anuraag Kumar Singh was recently awarded with the Certification of Commitment from the Central Vigilance Commission, India. The certification obligates the director with adoption of Integrity Pledge making him entrusted with the responsibility of holding highest standards of honesty and integrity in favor of the rule of law. Meeting the industry standards and satisfying the user requirement has always been the goal of SysTools. The continuous efforts and success in this concern is witnessed through the CRISIL ratings as "High Performance Capability and High Financial Strength" for the company. 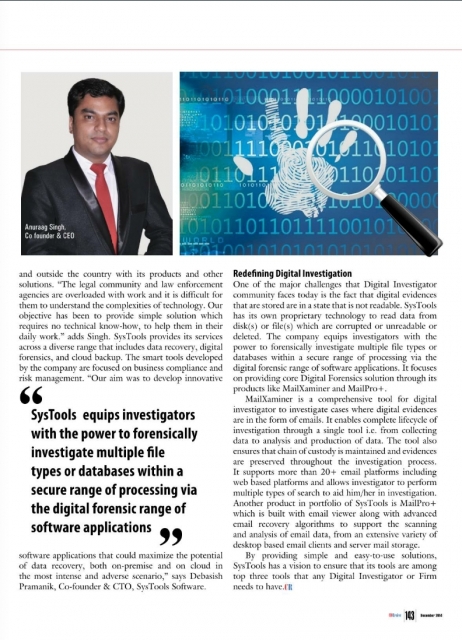 Known for its un-biased rating, research, and advisory services, CRISIL approves SysTools for their exceptional contribution in data recovery and digital forensics arena. SysTools PST Merge software get 100% clean award for delivering Virus/Ad/Spyware free tool.